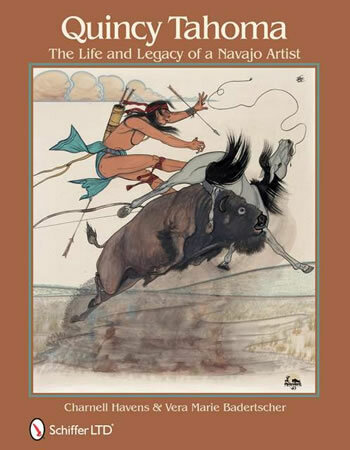 My friend, Vera, over at the Traveler’s Library, has co-authored a book that is an important documentation of the life of Quincy Tahoma, a legendary Navajo artist. I love that Vera and co-author Charnell Havens have published this book about this little-known, yet very talented, artist. The book highlights and preserves his work for those of us who would never have been exposed to Quincy’s work. I have a personal interest in this book as I love the Southwest. You might have seen my culinary tour so Santa Fe? So I was thrilled to be able to interview Vera about Quincy Tahoma. Q. We both have a common love for the Southwest, where Quincy Tahoma is from. What led you to your love of the region? A. Actually, I wasn’t so sure that I wanted to move to Arizona from Ohio when my husband got a job offer in Phoenix. I had never been west of Chicago. But we both have loved the Southwest ever since we set eyes on it. There are always mountains to look up to. The scenery is raw, varied, and dramatic. And I loved the multi-cultural aspect of the earliest inhabitants–whose ancestors are still around in the many American Indian tribes; the Spanish influences and the Mexican culture that permeates the area. When you first move here from a country of green, softly rolling hills and rivers that actually have water in them, it all seems rather bizarre. But a desert land, like the high plateau of the Navajo where Quincy was born, or the Sonoran desert where I now live, teaches you to look more closely and at the same time, revel in the wide spaces. Q. How did you discover Quincy and why were you so moved to write this book? A. As part of becoming familiar with my new state, I plunged into learning about American Indian culture. I worked on an annual national Indian art exhibition and visited museums and reservations. But I had not heard of Quincy Tahoma (1917-1956) until my friend from college days, Charnell Havens, told me about the paintings she had inherited and asked me to help her track down his life. (That was 2000.) I was fascinated by the drama of his life story, which in many ways parallels cultural developments of all American Indians during the 20th Century. Q. After the decade of research that you did and all the interviews of the people who knew Quincy, did you ever get the sense that there were/are a lot of undiscovered artists of his caliber? A. A lot of the wonderful American Indian artists–particularly the painters–of the mid-twentieth century have yet to have a biography written about them. They are known within the group of Indian art traders and collectors, but not to the world at large. We were impressed that everyone we spoke to, from academics and art dealers to eighty-somethings who went to school with Tahoma, were genuinely happy that someone was going to tell his story. And of course we met a lot of people whose story would have been equally dramatic and illustrative of their times. So I wouldn’t say a lot of undiscovered artists–but certainly there are American Indians who excelled in many fields whose stories are not widely known. Q. What was the one piece of information about his life and/or art that you were surprised to learn? A. I was surprised that although he was very handsome and quite a lady’s man–we have snapshots and love letters to prove it!–he never married. And after his school days he did not seem to date any Indian women. He lived with one foot in the “white” world, and one in his traditional world, compartmentalizing the two and keeping one secret from the other. Q. Besides looking at the book, Quincy Tahoma: The Life and Legacy of a Navajo Artist, where can I see his paintings? A. His paintings are available in many galleries, particularly in the Santa Fe area. You can also see his paintings for sale on line and at auctions. Some of the museums that display his paintings from time to time include the Gilcrease, the Fred Jones Museum and the Philbrook in Tulsa; the Cowboy and Western Heritage Museum in Oklahoma City; The Museum of Indian Arts and Culture on Museum Hill in Santa Fe; the Heard Museum in Phoenix; Arizona State Museum in Tucson; and Amerind in southern Arizona. Thank you, Vera! You’ve done a great service to the art world for bringing this artist’s work to the rest of us. Quincy Tahoma: The Life and Legacy of a Navajo Artist is available on Amazon, at independent bookstores, art galleries, and museums as well as at Tahoma Blog. Authors Charnell Havens and Vera Marie Badertscher can be contacted through the blog, or website, or on their Facebook page. Keep track of their travels at Tahoma Blog. I love the Southwest too. What an amazing experience being able to track the life of this artist. This book really makes me want to visit the southwest so I can see Quincy Tahoma’s (and Vera’s!) land in person. The book looks absolutely gorgeous. Thanks for helping us tell the story of Quincy Tahoma and Navajo land. I want to be sure that it is clear, though, that had Charnell Havens not initiated this project, Quincy Tahoma’s story would never have been told. And I would not have been able to meet the wonderful people I met and learned about Tahoma and many other artists of his period. How wonderful to read about this talented artist. I’d never heard of him till reading this book — and it’s a fascinating story. Highly recommended. this is an incredible book – what work they put in! great interview. This really is a beautiful book, it graces the coffee table in my Tucson home. And I appreciate the hard work that Vera and Charnelle did to make the book a possibility. As a southerner who came west in 2001, I agree with Vera about the beauty of the Southwest. It makes me sad to see so many people move here and then try to recreate gardens that they cultivated back East. 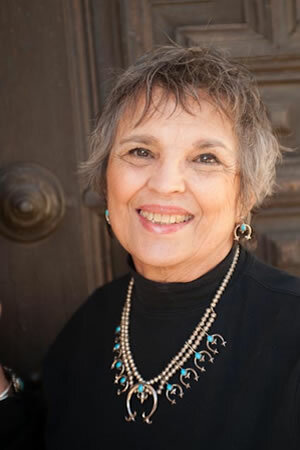 Embracing the Sonoran desert, as Vera has done, is the best way to appreciate the Southwest.